(SKNIS): Three students were recognized on May 30 for their demonstration of excellent reading skills during the annual Charles A. Halbert Public Library Read-a-thon. 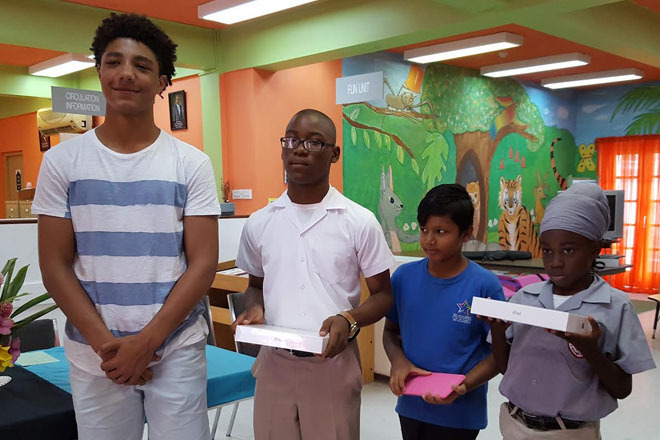 The competition saw 41 students vying for the title of most outstanding reader in which Daniel Thompson won in the senior division, Josiah Davis in the junior, while Aarya Mungli was the second overall winner. The children of Charles A. Halbert and the Governor General, His Excellency Sir Tapley Seaton, were present to distribute the prizes to the winners. The Governor General said that he was very pleased to be associated with the prize giving ceremony and was equally pleased that the Halbert family is still lending its support to the library. Sir Tapley mentioned that at his last visit to the library he pledged his support to help in any way he can to promote the library. He presented the library with leaflets about the history of Government House and his predecessors during his last visit. He once again made that pledge and said he will do his best to honour it. “I want to promote reading and learning and I think this is the ideal location from which to do this,” he said. The annual read-a-thon was held in April and the library has been hosting the programme for over 20 years. The objective of the read-a-thon is to encourage reading among primary school children between the ages of 5 and 12 and to widen their imaginations. Students were required to read books and then answer comprehension questions in order to prove that they understood what was read. All primary schools were invited to participate in the competition.